Grants from the Washington Square Health Foundation have allowed the North Shore Senior Center (NSSC) to initiate wellness and fitness programs on site in their apartment buildings for at-risk, older residents of public housing. North Shore Senior Center (NSSC) programs support the independence and well-being of older adults, enhance their dignity and self-respect, and promote their participation in all aspects of community life. Well-being is pursued zealously at NSSC. Eighty percent of NSSC’s resources go to providing social services to older persons — many of whom are frail, disabled, or suffer from dementia or abuse and/or have little income. And active older adults participate in more than 90 Lifelong Learning classes and events, which promote health and well-being. Indeed, NSSC has a long track record of offering health education and physical fitness programs, including Tai Chi, aerobic exercise, chair exercise programs, and more. NSSC even has a fitness center at one of its main facility, which is replete with exercise equipment and is staffed by fitness instructors. It became apparent, however, that many of our low-income clients living in public housing did not have the opportunity to participate in comparable health-promoting programs. Yet their needs are great. Monthly wellness programs and weekly physical fitness sessions help participants make more informed health decisions and adopt healthier lifestyles. The wellness programs 1) help participants better understand health and medical subjects and 2) teach them how to negotiate the healthcare system. But passive learning is not enough. 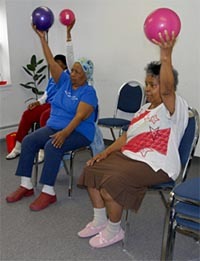 To attain and maintain health, seniors must engage in physical activity. Because sedentary seniors are at risk of obesity and illness such as diabetes and heart disease, each week, a physical exercise facilitator meets with participants for 45-minute seated exercise. The greatest achievement of these programs, however, is participants’ attitudinal change. Participants report that they feel more confident and more capable of managing their own bodies and their own health. This feeling of mastery is the key to motivating better self-care and the adoption of healthier lifestyles. Each of the programs — wellness and fitness – has recorded the achievement of measurable goals. Wellnessparticipants report greater ability to communicate with health care providers, better medication management, and new understanding about healthy diet. Participants are reading and interpreting labels on food packages more frequently. The regular participants in the fitness program are showing higher energy levels and improved balance and posture. They seem more energetic. Early in the development of the fitness program, it was difficult for many of the participants to use their elastic resistance bands. If the bands were to be placed under a participant’s feet or around her back, the instructor typically had to help. Now this has become quite easy for almost all the participants and most are using heavier bands now than they did earlier – a sign of greater strength. Yes, the focused goals are being achieved. But participating in a group offers yet another health benefit. Increased social interaction helps elevate moods and promotes mental acuity. Indeed, the fitness instructor reports that participants follow her directions more easily. With the help of the Washington Square Health Foundation, NSSC took its in-house experience in managing health and fitness programs to residents of senior subsidized housing. These health education and fitness activities are designed to help low income; older persons make more informed health decisions and adopt healthier lifestyles. There is no charge whatsoever to participants, and the program is not self-supporting. Therefore, the support of the Washington Square Health Foundation and other funders has been crucial. Residents of the subsidized apartment buildings gather in the housing common rooms, listen to presentations on health and medical topics, and take part in group discussions. They sit in a circle and share their experiences and expertise. Presentations on subjects such as how to give a medical history, what questions to ask your doctor; immunizations that are appropriate for adults; how to deal with arthritis, the meaning of high blood pressure, signs of stroke, and more. A program on eating smart offers tips on grocery shopping, managing hunger creatively, and the role of vitamins and minerals in health. The facilitator introduces the group to healthy snacks and refreshments. At the beginning of every meeting, participants sample foods such as rice cakes, Fig Newtons, tabouleh salad or soy milk. Many say they never tried some of these. Attendees are almost all women, more than half of them are over 75 years of age. They all show signs of the infirmities of aging that are commonly exhibited by members of disadvantaged minorities: arthritis, back or neck pain, breathing problems, high blood pressure, vision troubles, diabetes, aftermath of stroke. Participants’ dedication to the program is impressive. They look forward to coming. Many arrive for sessions with walkers or in wheelchairs. One participant who has the responsibility of caring for her granddaughter brings her to fitness class. The exercise instructor conducts weekly 45-minute exercise sessions in the common rooms of senior buildings. The aim is to increase flexibility, strengthen arms and legs, and improve posture. She says participants also need to experience the pleasure of movement, the reduction of discomfort of arthritis, and they need to become aware of the hazards of inactivity. In its 51st year, NSSC is providing services to approximately 38,000 persons in more than 23 communities in Chicago’s northern suburbs. NSSC’s social services and its auxiliary activities such as health and wellness programs all have the same goal: to help seniors attain and maintain their independence. Their quality of life is enhanced and gives them the freedom and strength to share their wisdom and experience with their families and community.